Washington, D.C. — On Tuesday, Energy Secretary Rick Perry told the World Gas Conference 2018 natural gas production is transforming the U.S. economy, reducing emissions and increasing our national security. In his keynote speech opening the World Gas Conference in Washington, Perry told energy ministers, gas producers and stakeholders across the value chain that innovation and President Trump’s policies have been key to that growth. Perry said because of natural gas, the U.S. economy is growing while the country has reduced carbon emissions 14 percent from 2005 to 2017. 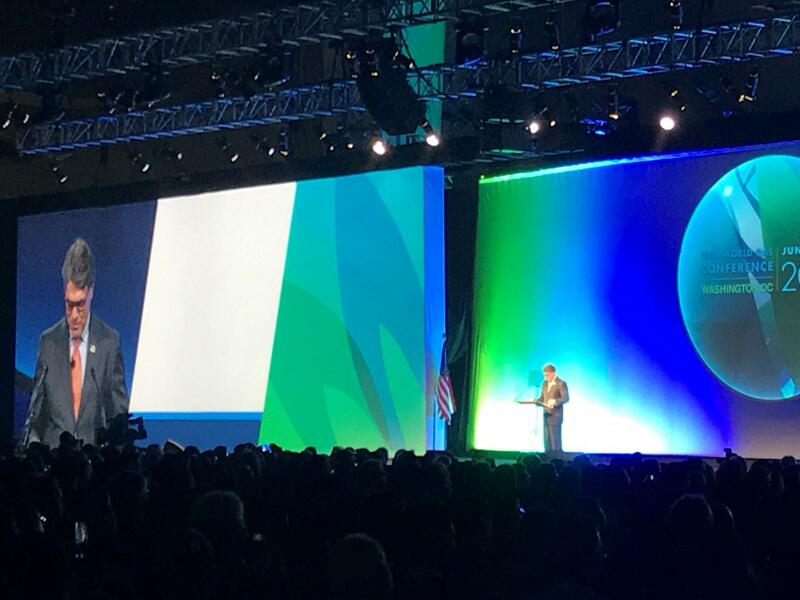 “Secretary Perry aptly notes that meeting our global energy demand, growing our economy and reducing emissions requires natural gas within an all-of-the-above energy strategy. With natural gas, you can grow the economy and reduce emissions. In the U.S., natural gas generates more than 30 percent of our electricity. It’s our primary source of electricity, and the more than 5,000 natural gas generators can serve as baseload power for our intermittent renewable resources. And natural gas is abundant. In June, the U.S. Energy Information Administration said U.S. dry natural gas production has increased 48 percent since 2005. Production averaged 73.6 billion cubic feet per day in 2017 but is expected to grow to 81.2 billion cubic feet per day this year. “U.S. LNG is also seeing significant growth. Six LNG terminals are either operating or under construction in the United States. Both the Energy Department and the Federal Energy Regulatory Commission have worked to streamline the permitting process, which has changed the trajectory of the natural gas sector and propelled the U.S. energy industry. “In the past year, more than 40 percent of our LNG supplies have gone to Asia and 30 percent have been exported to South America, Mexico and the Dominican Republic. America is now the largest gas producer in the world, and we believe we are on our way to becoming the world’s leading LNG exporter. “More than a billion people across the globe have inadequate access to energy. We expect American natural gas, but also coal, crude oil, and refined petroleum products will help meet a growing global energy demand and reduce energy poverty.